In Fanny and Alexander there is a season that doesn’t exist. It’s an endless winter. 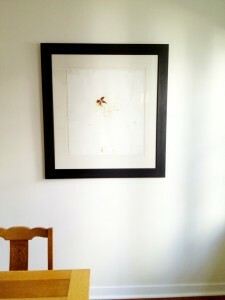 Interiors even in their warmth emit the same white glare as the air outside. In the outdoor scenes, in the streets of Uppsala, I hear the same creaking in the trees as I hear in the floors of the living rooms, the bedrooms where people sleep. The camera sees like a remembering mind—every snow-drift, every glass glinting in the light belongs to the same person, to the same memory, the same dream. The camera is searching the places inside a mind: Bergman’s mind? Alexander’s? Now mine? The winter moves in waves underneath the houses in summer. It is the ringing when the mother undoes her hair while her husband sleeps; it is the wailing that pierces her when he dies; later, it is the silent room in the new husband’s house the children must pass through without being heard or detected. In my memory of the movie there is another movie—the movie that has no beginning or end—the movie that changes as I grow and remember it differently. I can access the winter in that movie at will. It’s not even strange that the children are dressed in white gowns, or that someone is cruel to them. There is a thaw—a rushing river, another winter. 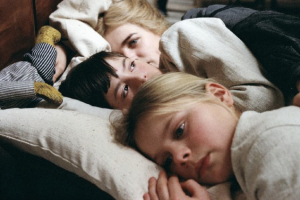 I first saw Fanny and Alexander as a child and I’m still haunted by it. The children’s fears felt like my own fears. To think of it is to access a certain time in my childhood, when I could hear the sounds of my father watching a movie on the other side of the wall. In some part of my mind it is Bergman’s Sweden in summer. I hold my hand out the window and mosquitoes come. The mother is in the house. I can hear the way the faucet runs. I can hear but I can’t see her children. What is important is not to remember the movie but to return to it—to return to it as one would return to a house whose walls may have shifted or begun to lean more deeply into one another, while the movement of your body through it has also changed. Sometimes what you recognize is a place you have been, and sometimes what you recognize is the memory you have visited many times since. The actors walk through rooms like visitors, like people remembered after their deaths. My father walks into the living room acting out the scene when the uncle farts up the stairs. I can’t stop laughing, but the uncle’s laughter is already the laughter of a ghost. The staircase will go blank; the child alone on the staircase after the death of his father will disappear into the landing where the winter air is bright but sealed inside a window. Is that window really there? How many times have I walked into the living room and the movie was on—my father there in the afternoon, some moment in the movie out of order—and even when I see the movie again all the way through—that scene is not there. I don’t know what drops in my stomach when someone in a movie dies. This time I think it’s the child understanding that he dies. Even in the longest movies everything is condensed. It’s a relief that life isn’t like that, that we don’t see things change that quickly. Sometimes I don’t want to be aware. Winter is hanging over the children’s bed as if the ceiling of the house in Sweden was suddenly pliant, suddenly made of cloth. Why can’t we see the mother? Why can’t we lie against her? In the stepfather’s house, the breath has been knocked out of the furniture. While the mother is berated behind the locked door, the anger in the boy turns his mother into snow to protect her. Snow, the raging river, the glass of oil on the table, the cracking ice. Erica Ehrenberg’s poems have appeared in journals and anthologies including Slate, Octopus, jubilat, the New Republic, CURA, the St. Ann’s Review, Everyman’s Library Pocket Poet Series (Knopf 2008), and Guernica. She has been a Wallace Stegner Fellow at Stanford, a fellow at the Fine Arts Work Center in Provincetown and at the Vermont Studio Center, a writer-in-residence at the Lower Manhattan Cultural Council, and will be a resident this summer at the Virginia Center for the Creative Arts and at Yaddo. At Fordham University she teaches writing and creative writing courses that often focus on the connections between literature, architecture, sculpture, film, painting, and photography. She has also given talks at the Storm King Sculpture Center on poetry and sculpture. My husband, his parents, and I stand at the top of La Sagrada Familia, spires spiking and tilting around us like great stone ocean waves, as if we are on the crow’s nest of a ship that is simultaneously pitching into sky and sinking. I’m usually scared of heights, but up here, even fear is under construction. After a century, only eight of the eighteen spires. After a century, the first stones of the Glory Façade: its roads to God and Hell both equally unbuilt. After a decade, my husband still sleeping nightly on a pillowcase speckled with blood from his brother’s death, still angry at his father for, in the hours immediately after, disassembling his brother’s cage of finches, giving them all to somewhere. The sky. The ground. The noise his brother made gurgling blood into tubes because he had AIDS and no one had yet drawn the plans for pills to save him. 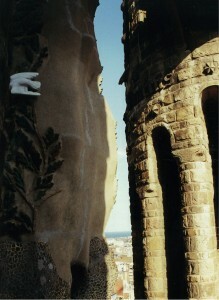 Gaudi wanted the Passion Façade to strike the onlooker with fear, the guidebook tells us. We are supposed to feel Christ’s sacrifice, to believe in death with high purpose. Forgiveness. But nothing is finished. The spire for Mary isn’t started yet; her body only more air. Everything is possible in God’s time, but nothing is for sure, an Irish singer we love tells us. My husband’s family is Irish and Mexican Catholic. Mine, Irish Protestant. My husband and I are atheists. We believe in suffering for love. My mother is three years dead. We travel everywhere as a family. We play Quiddler and drink sidra and take pictures leaning into the blue between stones. Asked why he’d lavished painstaking care on the tips of the pinnacles no one could get to, Gaudi answered, “The angels will see them.” My mother-in-law believed when her oldest son first came out he was a sinner. He died knowing she loved him. She still wouldn’t forgive herself for having to build backwards from faith to love. My father-in-law never talked, in the six years I knew him, about the cage of finches. That hammering. The way the finches belonged to no one. I never talked about what I feared: that I could not go on carrying, around the world, the same unchanging stone. Still: only eight apostles. Still no Virgin or Jesus. The guidebook says not even Gaudi drew plans for the whole basilica. He couldn’t know how others would need to complete it. A new subway tunnel shakes beneath now, like jackhammers, like heartbeats. The engineers say this is threatening the foundation. The engineers say this is threatening nothing. The angels say nothing. They roost, invisible on invisible spires. Alexandra Teague is the author of Mortal Geography, winner of the 2009 Lexi Rudnitsky Prize and 2010 California Book Award, and The Wise and Foolish Builders (Persea 2015). She is Assistant Professor of Poetry at University of Idaho and an editor for Broadsided Press. I have been in love with The Brothers Karamazov for a long time, but for a long time I was unable to write about it. Dostoevsky’s last novel is about many important things—sin and salvation and crime and justice and neighborly love—but, to me, it has always been mostly about the death of a child. Dostoevsky dedicated it to his wife; their son had died at age three two years before it was published, and every page of it screams their shared anguish and their passion. There is beauty here in the death of innocents. At the end of the book, when Ilyusha, dead at age ten of tuberculosis, is lying in his grave, flowers are blooming, and a crowd of his schoolmates has gathered; they promise to love and remember each other, and they are full of grace and lust for life and boyish exuberance and appetite for the funeral feast and in their excitement they shout “Hurrah!” The epigraph to The Brothers Karamazov is taken from the same lines in the Gospel of John that, a year after the novel’s publication, would become the author’s own epitaph: “Verily, verily, I say unto you, except a corn of wheat fall into the ground and die, it abideth alone: but if it die, it bringeth forth much fruit.” There is a fellowship and a flourishing to be found in death; a single death can feed a multitude. Yet Dostoevsky offers no easy assurances, and The Brothers Karamazov is equally about Ivan Karamazov, who hates God for letting children suffer. If God’s kingdom is one in which even one child dies, then Ivan will return his entrance ticket, and while his nauseous rebellion is the flipside of the novel’s concluding picture, it is equally as passionate and true. The most haunting figures in the book are the mothers of dead children, women who cannot be consoled. Several years ago, I was in the middle of a long dissertation, the last chapter of which was supposed to be on The Brothers Karamazov. That year, we also wanted a child, and I found that I could not start writing the Dostoevsky chapter until I was pregnant. By the end of our son’s first year I understood why I had been saving the book for so long. With the birth of any child, parents are confronted, in their very joy, with the fact of mortality, the “Hurrah” of life always echoing with the murmurings of death: the dangers of childbirth, the pitfalls of infancy, the simple fact that all children are born to die. Amongst all of the triumphs of modern medicine, which assures us that so very many of our babies will survive childhood, one of the few drawbacks is how infrequently parents are able to avow their fears. We have been left unable to mourn the births of our children, and the anguished cries that would have been so familiar in Dostoevsky’s era have been muted into an underground melancholia, or a free-floating anxiety. I think I was saving The Brothers Karamazov until I had a child of my own as a way of making me confront head-on my horror at my baby’s mortality. What I couldn’t have known was that my son would have made me do that anyway, and that the intensity of my need for Dostoevsky’s novel was more profound than I had imagined. He was born on December 30, in the evening. It was a difficult and strange time. The doctors put him in the NICU, and once, as my husband and I entered the room to visit him, we heard shouting and panicked; we were relieved to realize that it was the sound of New Year congratulation, a few moments of well-wishing, the only celebration the staff allowed themselves. We were able to leave the hospital within a few days, though over the course of the next year we were back often, twice for long and complicated surgeries, the first longer and more complicated but the second—because he was older and, when the mask descended to put him to sleep, knew something scary was happening—more harrowing. After it was over someone asked me whether at any point during those hours in the waiting room I thought he might die, and I responded that I didn’t know what “think” meant in that context, although I do remember one day, shortly before the first operation—the one that changed his face most visibly, took away the gaps in his upper lip and smoothed the skin under his nose and corrected the beautiful defect that made his smile preternaturally wide and joyful, my baby—when the weather was stunning and we played outside nearly all day and I only brought him in when it was time for a late-afternoon nap, planning on heading out again once he was awake to walk our “loop”—a route in Central Park that I used to amble with him in the Snugli, the first times in my life that I have felt things to be as they should—and as the nap went on and on, and five o’clock turned to six and six to seven, I realized he was down for the night, and in the hollow of his unplanned absence I felt horribly and mutely bereft. In that moment, perhaps, I dimly thought the unthinkable. Readers often cry at the scene in which Ilyusha’s father, having just lost the boy, notices his child-sized boots still standing in the corner and is overwhelmed by hysterical pity: for his dead son, for himself, for the shoes that are too small to go forever unworn. The year that my son was born I was surprised to find myself crying at an earlier scene in which Alyosha Karamazov, Ivan’s brother, approaches the group of schoolboys—Dostoevsky has no illusions about children, they are seething with childhood perversity, tormenting the already sickly Ilyusha, no sublime brotherhood yet—and, by way of intervention, starts making conversation with them about their school bags: “I used to carry a bag just like yours, but we always wore it on the left side,” for easy access. Just the right way to speak to a child, practical and kind. In my imagination, when Alyosha walks up to the boys their brows unfurl and they begin to smile. It is Alyosha who, along with Ilyusha, will teach the children to love each other better. My dissertation adviser was the mother of two now-grown sons and once told me that when her boys were little and they lived in California she always had to send them to their first day of school with two backpacks each: the one that they would use all year, to carry snacks and number two pencils and maybe a calculator when they were big enough, and one red one, with meaningful trinkets and a note, to be stored away in a special locker, in case at some point during a school day an earthquake were to sunder parents and child. I thought that if I could paint I would paint a child, back facing the viewer, walking away, wearing a red backpack, taking with him his things, the instruments for his life. 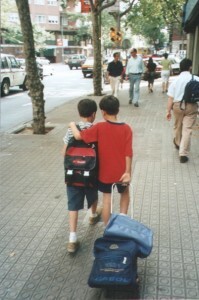 My son starts school this year; just preschool, so maybe too early for a backpack, although maybe not. He may need to carry snacks, and I think he will enjoy the feeling of independence and responsibility. I hope people talk to him in just the right way, and that they make him smile. I hope he will have everything that he needs. Emma Lieber teaches Russian literature at Rutgers University. Her work has appeared in New England Review, her essay “Realism’s Housewives” in 33.4, The Massachusetts Review, Slavic Review, Slavic and East European Journal, and Nabokov Studies Journal.